Sorry that I haven't been updating my blog but pretty sure most of you follow me on Facebook. Yes, guys, I finally made it to London - my dream place to visit. Jane and I decided to go see Coldplay and James Bay in England. They are the push, or else I really wouldn't want to spend so much. I know some of you want to know how much the tickets cost. We bought our tickets online, they were actually from resellers. We didn't know, when we received the tickets, they were stated £45, lol lol lol. There were people selling for only £20 at the door on that day. But of course, I'll still advise you to get your tickets beforehand. Today I want to talk about performing artistes being late. I just want to share about my experience, it can be useful to you guys who want to plan a concert trip. So, James Bay didn't perform in London. He performed in Bristol which is 2 hours away from London. We spent £6=RM35 for bus ride to Bristol in the morning. We are not familiar with London, we started our journey at 6am. It was so tough for us to find the right train station. We were running around like crazy but I love London, people are helpful. We managed to get to the bus station on time. Anyway, I don't know if it was the management's fault or organizer's fault. The event stated that doors open at 4:30pm, performance starts at 6pm but concert started at 9pm. So, Jane and I were there before 6pm. We also waited at the door to the stage for a bit. Lucky enough, we got the first row, hahahahaha. It was a windy day and it drizzled in between. I guess God heard my prayer, I prayed that it doesn't rain because there was no shelter, an open area. I always enjoy good music but being late kills it sometimes. People always think that being late can build up excitement and anticipation. To be honest, I think it's the other way round. I have watched many concerts, maybe not a lot but I think I qualify as a concert junkie. I spend so much time, energy, money on concerts, haha. Being a music blogger gets the perks, sometimes I get free tickets. Opening act started performing at 8pm. They are really good, they were amazing on stage but I wasn't feeling it at all. I know that having an opening act is to help entertain the crowd before the main act comes on. Opening act is also a great opportunity to new artistes, everyone has gotta start somewhere. It benefits the audiences too, we paid a price to see more than one artiste. The most impressive opening act I watched was Sheppard, they opened for Kodaline. You know, you don't get many international artistes as opening acts in Asia. James Bay once opened for Taylor Swift, Ed Sheeran once opened for Taylor Swift too. Asian music fans don't get international opening acts or special guests. Imagine going to Rihanna's and Drake comes on to "work" too, I might faint. Or when I watch Coldplay and Beyonce just decides to join the stage, that I'll faint for sure. This will and might only happen in the States and in Europe. Yeh, opening acts should help to build excitement, to warm the crowd up. Trust me, on that day, the opening acts were so good but I doubt many enjoyed. Everyone's patience was being put to test. Doors opened at 430pm, concert was supposed to start at 6pm. Opening act came on at 8pm. We waited 2 hours for the opening act. After the opening act, we thought James Bay was coming on stage. We finally saw James Bay. I don't think it's the artiste's fault because sometimes the organizers want what they want. I don't know what were they waiting on. The label? The organizer? The management? I've come so far for this, 3-hour wait is nothing. The problem was we had to catch a train back to London. There were no bus tickets left to get back to London. Only 830pm bus tickets were available. I thank God I didn't buy the tickets at 830pm. the concert starts at 6pm, they probably end at 730pm or 8pm. We can't stay over in Bristol because we were going to Paris on the next day. So we bought train tickets at 10:30pm beforehand, just to be safe. The train tickets weren't cheap, it was £30+ per person, nearly RM200. We left the venue at 10pm because we weren't familiar with that area. We figured we needed time to look for the train station. Walking would be too risky, so we took a cab $$$$$$. We only watched James Bay for less than an hour. Thank goodness, he sang my favourite song "Move Together". Sad that I couldn't hear "Best Fake Smile" and "Hold Back The River". We had to leave even when we didn't want to. Still love him though, very good looking. Very into his music playing. Loved it when he played the riff of "Let It Go", classic. I always like to share the music I love. I like to share the good stuff. Met up with Ashley in Bristol and convinced her to go see James Bay with us. She bought ticket at the door, she also waited for 3 hours, hahaha. I hope she enjoyed the show though. A magazine interviewed me last few months. They asked me what do I want to do this year. My answer was to watch either Adele, James Bay or Sam Smith live. I really made it to see James Bay and I know every song on that album. Best thing is that first album/first tour is always the best. I missed Ed Sheeran's first tour which is pretty sad but I still enjoyed "x" very much. For Kodaline, I didn't miss anything, I went to the first and second tour. For James Bay, it's the first tour because he now only has one album and I made it to his show. you should never miss the first tour. If you really like that artiste and you want to see him/her live, make it to his/her first tour. It will be very unforgettable, will be so worth it. I've watched a few shows and the performing artistes were so late. I don't know why people think that it's ok to be late. Coldplay's set, 430pm doors open, Reef at 4pm, Lianne La Havas at 645pm, Coldplay at 8pm. This is cool, there is a rundown and if you want to be there at 430pm, that will be your choice. Stick to the rundown, the schedule, at least we know what we're up for. 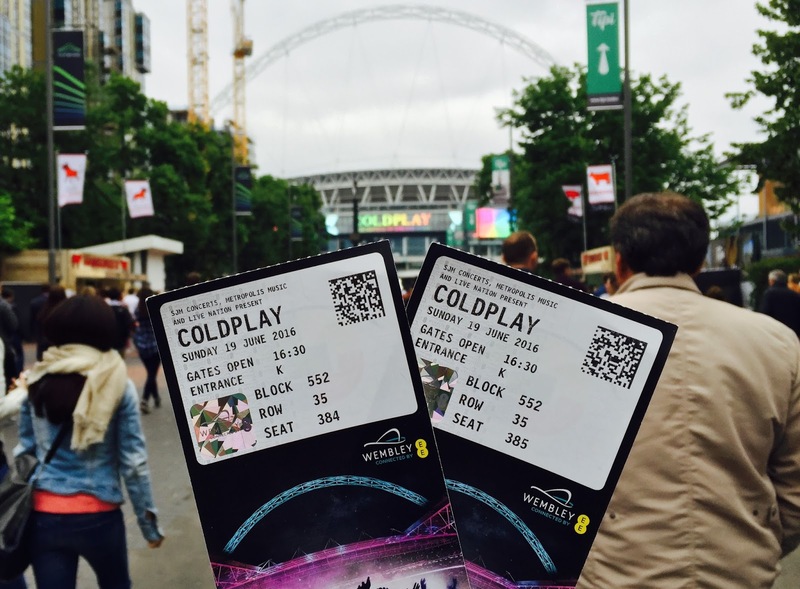 Coldplay started sharp but of course, it's Wembley stadium. You gotta be on time but still, Wembley or not, artistes should be on time. Ok, it's acceptable to be 30minutes late. Any more than that is so... mood-killing, so disappointing, so disheartening. The latest I encountered lately was Tame Impala live in KL. They were late for 2 hours. M83 was late for an hour. Not too bad because it was an indoor venue, we were safe and cool staying in. James Bay was the worst, outdoor, 3 hours. The most unforgettable was Mariah Carey in KL. Open area, everyone was wearing raincoats but it was raining too heavily. The open area in the middle is VIP area, you know. People pay big bucks for it. She was 2 hours late and came on stage, mostly lip-sync. 30minutes throughout the show, so many people left, I left too. Ya, some artistes are so big that we, small fries, can't say a thing. Even if we aren't happy about, nobody cares. Mariah Carey doesn't care if you're upset, she has got big sponsors. an artiste will not be anything at all without fan's support. One or two seem little but it's this "one" and "two" that accumulate to a big number. Little did they know that some fans really make a lot of effort just to see them. I do sincerely love the music and I make an effort to show support, lol. Love to read more about your concerts' experiences! <3 Hope that I'll be watching my favorites' concerts one day.